The Giant Mine strike, and the underground explosion that killed nine miners on September 18, 1992, has been called the bloodiest labour dispute in Canadian history. Months of contract negotiations that were going nowhere resulted in rising tension between Royal Oak Mines, owner of Yellowknife’s Giant Mine, and its unionized mine employees (see map). On May 22, 1992 Royal Oak locked out members of the Canadian Association of Smelter and Allied Workers (CASAW) and at midnight they went on strike. 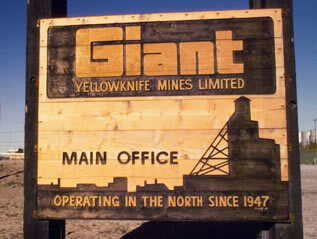 Giant Mine had been in operation for 44 years, wages were high and there had been relatively few strikes or lockouts. Yet it was obvious from the beginning that this lockout was going to be long and would likely turn violent. In an unprecedented and provocative move Royal Oak brought in replacement workers and hired Pinkerton Security to protect them and mine property from the strikers. Royal Canadian Mounted Police reacted to the rising threat of violence by bringing in, on May 26th, extra officers, including a riot squad. This squad was called into action on June 11th when strikers, police, and Pinkerton guards clashed outside Giant Mine’s main gate. When police finally got the situation under control they had arrested 29 people charging them with various offences. On June 30th it became apparent that strikers or strike supporters were somehow getting underground and painting warning signs on mine walls. The months of July and August were relatively quiet but in early September tensions again rose when strikers planted a bomb that destroyed the mine’s ventilation heating plant. On the morning of September 18th word began to circulate through Yellowknife that there had been an accident underground at Giant Mine. At 8:35 a.m. an unusual explosion had been heard and felt from deep underground. Miners who went to investigate found, on the 750-foot level, a mangled man-car and the remains of nine men. Within a few days it was clear the explosion was not an accident. After a long police investigation Roger Warren, a striker, was charged and convicted with nine counts of murder and is currently serving a life sentence.